Excuses are plentiful and everyone uses them. Mine, for the lack of posts over the past four months is house ownership. The Noswal’s finally started along the good old Australian dream, owning your own home. So we’ve got it all now, two kids, a dog and a mortgage! 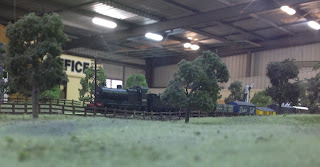 - the new shed, room for 2 cars, but really its for the layout, workshop and potential mancave. Sturminster now has a new home, in a 6m x6m garage. 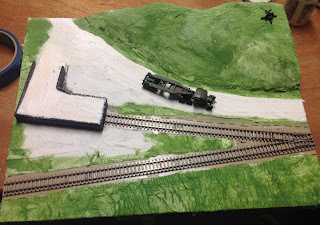 This is a nice fit, as you can now walk around the layout on three sides, and still have room to swing a cat. There is a distinct lack voltage to the shed, but it’s only a matter of running a 30m power lead from the house to add some spark. - the inside, still requires some work, especially more dropsheets to prevent the gecko dropping. Our local N gauge/2mm group celebrated our 50th meeting yesterday, Sat 12 Mar 16. I haven’t been to all the meetings, distance and work have prevented that, but I’ve found them to be very informative and much useful knowledge has been shared and gained. It’s also been very helpful for making collective purchases from the likes of 2mm society and shapeways etc, as it reduces the postage fees. As mentioned last year, we were set a diorama challenge, to be completed by Dec. Life got in the way for some of us, and deadline was pushed back the 50th meeting. The results were very impressive. - Nuclear, with home made 3d printed bits! - My somewhere in England dio. - Most happy with this piece of kit. Now that this challenge is over, I'm now been tasked with coming up with the next challenge and its associated rules. This time I erring towards a scratch-built wagon, but I still need to investigate further. - Maybe something like this? So after a brief trip away for work, it was back to work on the diorama. The final batch of decals have arrived while I was away , so now all three tanks, the Scammell and the Bofor’s are correctly marked for the 7th Armoured Division. They have received a coat of dullcoat and now just need some weathering. And the barrel needs to be fitted to the Churchill! Back to the diorama board itself, it was a matter of building up some layers of base textures and then commence adding the scenic materials. First up was the ground texture, especially around the ramp area and the Bofor’s gun position. Next will be some static grass and finally the ballasting of the track. Researching some picture of anti-aircraft positions, the guns had some form of protection. In most cases, the humble sand-bag. So sand-bag making commenced. These are just strips of air-dried clay, cut to shape and then glued into position. Once dry they will get painted a nice shade of hessian/dirt. At some stage, I will need to get on with finishing the wagons. 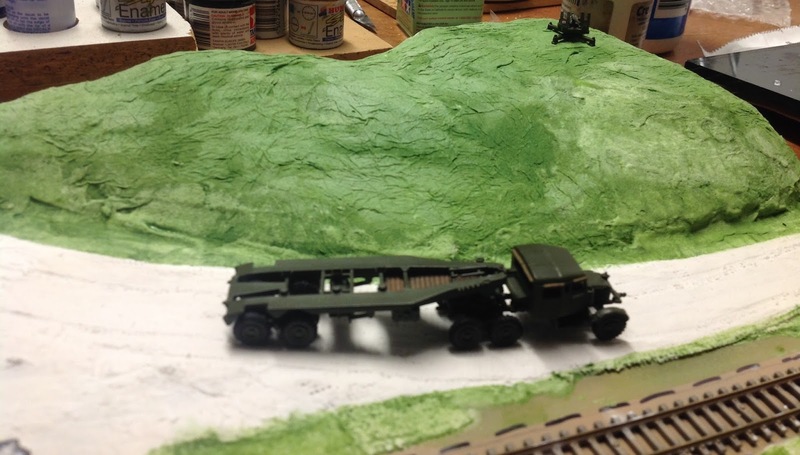 Work continues in the diorama and some other new projects. I’m quite happy with the Scammell, and now just need to weather it. I’m still a bit undecided as to whether I will deploy the 40mm Bofors on the high ground, that will have to wait and see. - To keep or lose the Bofors? On new project front, I came across some S&DJR 5 plank wagons bodies on Shapeways. They are in 2mm (1/152) and will suit me fine and add bit more variety to the rolling stock at Sturminster. They printed quite well and just need a through clean-up. They require a 2FS chassis, which can be knocked-up fairly quickly. Meanwhile, junior modeller turned the big 1 on Saturday. Take note of her reading material! - Yes, it hurts when she runs over your toes! When I started this blog, I did state there would be delays and gaps, this has been one of them. Work on the layout has been minimal since attending the Toowoomba show. Admittedly it was a bit of a rush to get it to the stage it was to exhibit. 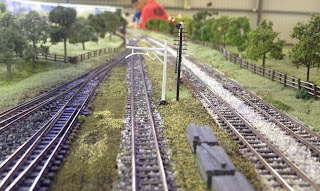 Over the course of the exhibition, we were looking at some pics of the station at Sturminster and comment was made on the uniqueness of the swan-neck lamps on the platforms. 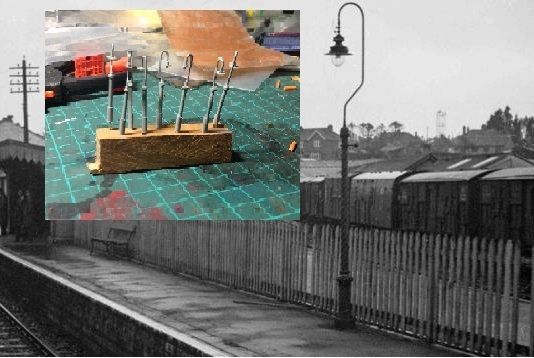 As a part of the prep to get it ready, I had just used some Langley whitemetal lamp posts, which do the job, but are not representative of the genuine thing. After some brain storming, and some test and evaluation, a design was found, comprising a paperclip, a sequin, a glass bead and several diameters of tubbing. A satisfactory result. 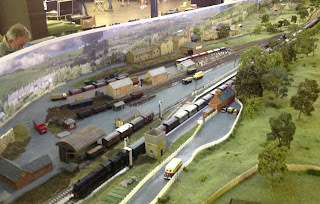 At the end of last year, our local N gauge/2mm FS group was set a diorama challenge. 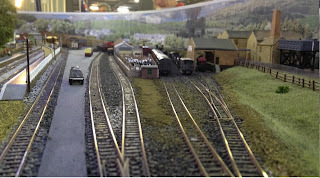 While the rules were thrashed about, it basically boiled down to building a N/2mm scale diorama, based on UK prototype, a minimum of one wagon and a length of track (60’) and it is to fit inside a standard archive box. Challenge accepted. 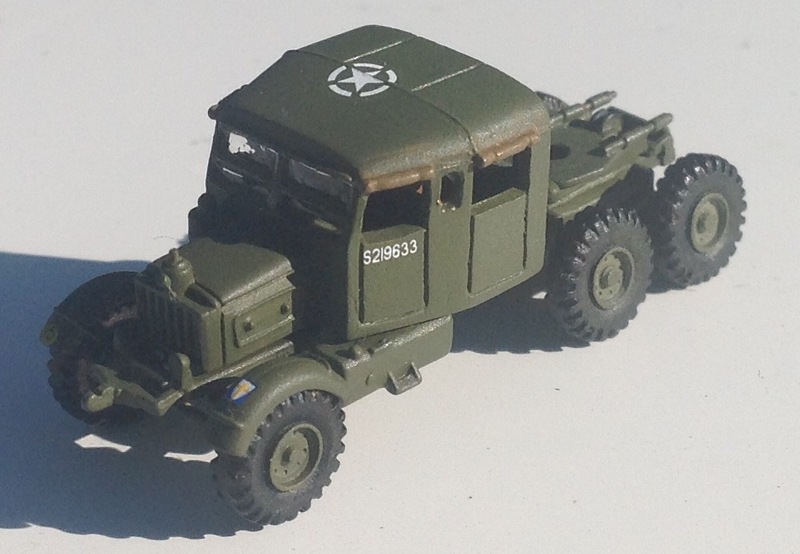 I’d recently come across a new supplier of scale WW2 military vehicles, Arrowhead Miniatures. In particular I liked the Scammell tank transporter, and the diorama challenge gave me the reason to get one. As with any new project, I leapt into it over the Christmas period, gathering additional pieces of equipment and find other spares within my horde. By late Feb a firm plan was locked in, but then the impending deadline of the Toowoomba exhibition at the end of May was approaching, so diorama work was paused. I’ve only now, this weekend gone gotten back into it. Well, the 1st exhibition is done and dusted. A 300km round trip, 2 compete days of running, good friends, great atmosphere and some cleansing ales. Was it worth it? Of course it was. I won’t say it was a panic to get it finished, but as the deadline for departure approach, more and more of the minor things were not crossed off the list. These can now be competed at a more leisurely manner. A majority of the feedback was very positive with many wanting info on the techniques used and type of materials and products used. What little negativity I did get was either about the layout height, 1.2m to baseboard, of that the station and yards were hidden by the trees. I’m sorry if your child can’t see, but you’ve got tow arms, pick them up. 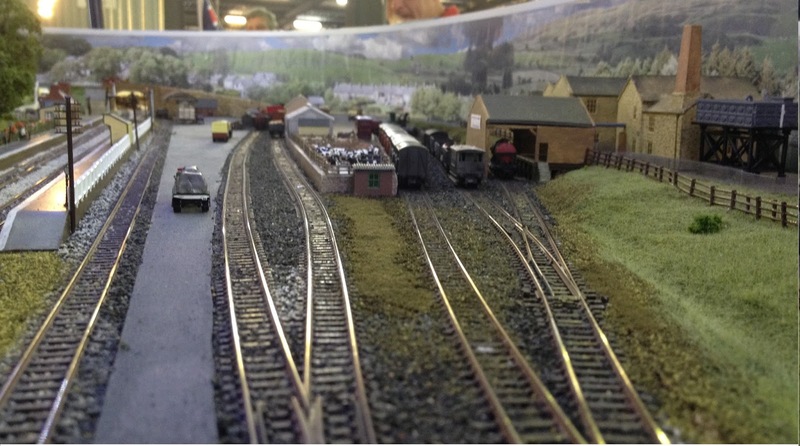 It’s my layout, built for my enjoyment and comfort. As for the foliage, I’m trying to depict a particular place and there are trees there. Running wise, we didn’t stick to a set schedule. We had a selection over 30 made up trains and they ran as we saw fit. The odd wagon or three continued to de-rail or uncouple, so it was 3 strikes and they were off! For locos, my new Black 5’s continue to throw traction tyres. We discovered this last year, and I was advised to get some bullfrog snot, which I did. It just that I haven’t applied it yet! Will I do it again? Most likely, we even got an invitation to attend the Gold Coast exhibition in July (just need to discuss with Mrs Noswal). Sturminster Newtons debut is only days away. While never finished, it’s come along away in past couple of months. After tonite I’m putting a halt to fiddling and scenicing and the next few nights will be cleaning tracks and prepping rolling stock.